This time round we tackle the AFC West – predicting where each team will finish with some interesting discussion and differences of opinion on how the four teams will fare. Find out which team we have finishing first on one persons list, and last on another, in the toughest to call division yet. 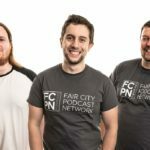 This episode also marks the first time all three of us have been in the same room recording, now that Gav has changed jobs and works at the same location as Steve and Andrew.